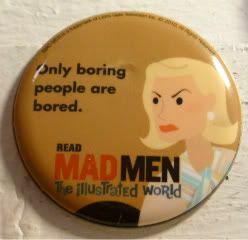 This Betty quote from Mad Men: The Illustrated World is something I've heard all my life. It's why I try never to be bored. I can forgive a lot of things, but boring people, not so much. Besides, there's always something to do...even if it's sleep. You just have to find it. Remember how I don't like to read too much into anything? That I take art for art's sake? For the most part, that extends to television and film. Which means that I enjoy what I'm watching, but don't really think too much about the cultural ramifications or "statements" made by any show. I make no apologies for it: It's television. It's film. It's how I was surprised when creator/ep & showrunner/headwriter Weiner managed to put Mad Men into much more context than I'd ever thought about before. The conversation centered around how the show is a pretty great love letter to New York in the golden age of the 60s, using advertising as a useful and interesting backdrop for some really screwy, but always human characters. Which I always knew...but for me, the ad agency shenanigans was my entree to the show. I've always overidentified with the characters within advertising construct, with their crazy lives secondary. Or, if I'm honest, tertiary, really, if you consider the cultural history of the 60s that's more interesting for me. Don't get me wrong - I love (almost) all of the characters, and can get pretty invested in their lives, but it was always the advertising - the clients, the presentations, the creative work, the dynamics between the account/creative/management teams - has always been what drew me in and repulsed me at the same time. I find myself unable to get too deep into a retelling of the night, otherwise, it gets into a debate on Jewish culture, advertising metaphors, why Don Draper isn't naked more often, the Bay of Pigs, and the decaying of New York. Just know it was a great session...of course, now with this new insight with which to watch the show, I feel like I need to rewatch Mad Men from the pilot all the way through. What? So far, that's only 52 hours! So, why isn't Don Draper naked more often? It was during the "is basic cable better than premium cable, which is ultimately better than network" segment of conversation. Weiner spoke of how if you notice, the leads and/or higher-tiered actors on the show that are showing skin all the time. Apparently, it's an actual bargaining/status chip...which I kinda always figured and joked about, but never really accepted was an actual contractual thing. That explains why Daniel Dae Kim always has his shirt on, while little Alex O'Loughlin is constantly shirtless, I'm assuming. Soaps must be a whole different magilla, though.